The Cavaliers continued their stumble toward Lottery Land yesterday in a game against Detroit. The nights of stagnant offense and porous defense are adding up, with the Cavs dropping their fifth straight contest and eight out of their last nine. Its evident the franchise needs another volume scorer to go along with Kyrie Irving and perhaps a big man to take up some of the rebounding load. Do you trust these men? Unlike the other teams in this town, however, it's not farfetched to believe the Cavaliers can get it done. The Cavs are the city's most accessible franchise, boasting a front office with a clear path to success that isn't ludicrously drenched in secrecy or stifled by un-ambitious ownership. It wasn't always this way with the Cavs. Fans were rightly worried at the beginning of last season when our slightly unhinged owner insisted on keeping an obviously mediocre roster mostly intact, perhaps to spit in the eye of a recently defected superstar and those in the media who said the Cavs were the worst team in the league without said superstar. Well, the media was right on this one, and for once I didn't mind. Truly, last year's embarrassing 26-game losing streak was the best thing that could have happened. A month's worth of "L's" smartened the front office up quick, and the Cavs gave up foolhardy dreams of pseudo-contention for a real rebuilding plan. Goodbye Mo "Mr. January" Williams, hello unprotected lottery pick. And what a lottery pick! Yes, the Cavs got lucky in winning the lottery, and doubly fortunate in acquiring a grounded, coachable superstar-in-waiting with the selection, but they would have had neither if not for clearer heads prevailing all the way back in February of 2011 when Mo Gotti was jettisoned. The Cavs have won the lottery before, only to squander the winnings. Now it seems they're investing a little more wisely. The recent Ramon Sessions trade may seem like a big deal, but it shows the direction they're moving in. Sessions was one of the better players on the team, a perfect veteran compliment to our dynamic rookie point guard. But when it was obvious the team was at best a fringe playoff contender (a minor miracle itself to be honest), and with no chance of Sessions being a starter anytime soon, the Cavs once again did the right thing and shipped out an expendable piece for another first-round draft pick. With the hyper-speed growth of Irving, another stud scorer to go alongside him and the return of Anderson Varejao, a playoff push next year is not unrealistic under Byron Scott's leadership. Championship contention is years away. It may never come at all. 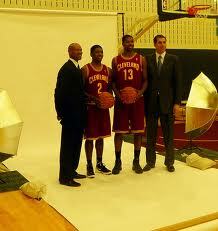 Still, there no reason not to believe GM Chris Grant will work to give the Cavs a legitimate shot at the promised land. That's more than you can say about our other franchises at the moment.